This is what we prayed for. This is what we hoped for. This is what we longed for as we faced month after month of disappointments while we were trying to get pregnant. And God was faithful and blessed us with a new baby boy. But wow, is this difficult. I find it really hard to write about peace when I feel like my own home is pretty chaotic. While our baby is really healthy and mostly content he still is a baby with demands. When you pile on an even more demanding three year old with a momma who is tired and a daddy who has very little sense on how to keep all of this afloat we get – chaos. Right now with the stresses of growing a family I feel quite unqualified to talk about peace. I remember about three years ago feeling similar stresses when having our first child. We had no idea what to do so we simply got overwhelmed. My wife tends to handle these situations a lot better than I do. She might get upset or stressed but she finds a way to push through it. I tend to internalize it and not talk about it. When my internal discord finally makes its way to the surface it is pretty messy and I’m never too proud of it. It’s the opposite of peace, really. I was a little put off by that because it seemed trite and didn’t offer any relief from my circumstances. It seemed like something old people with no problems say to whiny Gen-X’ers who haven’t known suffering. But, he was right. Things did get better. I matured and grew as a father and husband. I learned new patience and endurance to be the person I need to be for my family. And as I read through the readings this week, Isaiah 11:1-10 really speaks to what peace looks like. The prophet was speaking to a people going through exile, disappointment, and failure. He speaks of a time when the predator will lie down next to the prey, where the child can play harmlessly with the snake. Why would words like this bring comfort and peace to a people going through such calamity? The prophet spoke about a day to come when a savior would walk the streets of mankind showing the world how to live in peace. These words first bring hope (which we wrote through last week) to a people who had lost hope so that they could have peace through their separation from God. I’m not sure how these words came across to the hearer or reader. They may have come across as trite or even cliche, but to those who already had hope God would come through – would bring peace. I believe there is a reason the first week of Advent is all about hope. WIthout that foundation there is no room for peace. You see, when hope is established peace can reign. We can know the hardships we are experiencing will make something new and great. The good doctor was right. With our first son, things did get better. The chaos of having a newborn passed and brought about a new set of challenges – but we handled those challenges better for going through the difficulties. Those stressful times passed. And now we are in the middle of a new stressful time. 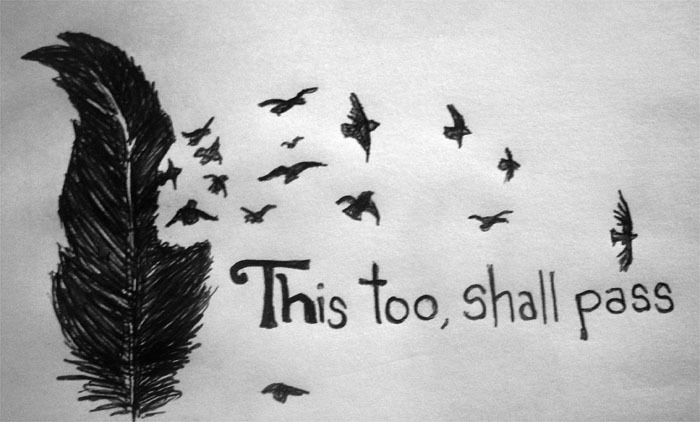 But, I know this too shall pass and I can have peace things always get better in God’s kingdom. Because of the hope that God will never leave us or leave us to our own devices – we can have peace in the toughest times.